One name, four letters, two syllables: "Sita". A daughter, a friend, a princess, a wife and a mother, Sita forms the heartbeat of Anita Ratnam's interpretation of the sacred Hindu text Ramayana through the contemporary dance theatre, 'A Million Sitas.' Anita Ratnam who hails from Chennai, has created her version of the epic tale of Ramayana from a strong women's perspective - a most-fitting tribute to all women during Women's Month in South Africa. Anita who trained in Bharatanatyam, Kathakali, Mohiniattam, Tai chi and Kalarippayattu is one of India's foremost proponents of contemporary dance today. Having done Bharatanatyam for most of her life, it would be difficult for Anita's body to disguise the natural yearning to infuse Bharatanatyam into her work. In 'A Million Sitas', I could easily distinguish a Bharatanatyam trained body as well as a theatrically-trained mind, clearly in synch to create poetry in motion. Ratnam has made use of 'nritya' (the use of acting or gesturing) through her storytelling, 'mudras' (hand gestures) that represent different objects such as Rama's bow and arrow, 'sollukattu' or 'nattuvangam' (vocal rhythmic beats) used as a linking device between scenes and abhinaya (facial expressions) by giving life to each woman's physical appearance, be that of a happy Sita or a witch like Manthara. A silky green glove frog, witch's nails, a length of gossamer fabric and pages of a newspaper came to life to tell the story of Princess Sita through the eyes of four women: Mandodari (wife of Ravana), Ahalya (wife of sage Gautama), Surpanakha (sister of Ravana) and Manthara (trusted aide and maid of King Dasaratha's third wife, Kaikeyi). In each woman, we identify weaknesses such as jealousy, greed, power and ego. South African set designer Reshma Chhiba has chosen to keep the set simple yet powerful in its presence and especially in Anita's presence. Anita's use of space is excellent as she glides between hanging textile drapes made of ash, hessian and shwe-shwe which denote different geographical areas (Ravana's kingdom, the forest and Rama's kingdom). Added to the graceful moves of the dancer is the soulful refrain of a popular marriage song "Seetha Kalyanam." We are introduced to the song for the first time when Princess Sita weds Prince Rama. She uses a length of material to symbolise the couple circumventing during Hindu fire ceremony as well as playing on the ceremonial swing by using the red shwe-shwe material to symbolize her beloved husband, Rama. In another scene, the same song is introduced in a different guise. Anita tells how it is a Hindu custom that on the morning of Diwali the hands of young women are smeared with oils and powders. All the while, mothers would sing "Seetha Kalyanam" which translates into the wish that the daughter would grow as beautiful as Sita and have a perfect and happy life with a husband as virtuous as Lord Rama. Anita chooses to comically sing her honest version of the song. Retaining the tune of the song, the dancer changes the lyrics to denote the subjugation of women, their oppression, and their lack of freedom to be independent thinkers. This left the audience in stitches. The melodic vocals by Saranya Krishnan were executed to the tee. Each song she rendered had a meaning of its own. The classical piece "Janaki Ramana" is a description of the Ramayana in a nut shell, describing Rama's elegance in a verse from Kamba Ramayanam written by a famous Tamil poet. Homage is paid to Sita's beauty through the song "Kaana vendum." However, the narrator is at pains to point out that there are very few songs on Sita as compared to those of Rama. South African percussionist Mandla Matsha gave an African twist to this epic tale especially with his powerful opening beats on the drum to set the story. The stage of the Elizabeth Sneddon has been truly blessed to have been graced by the feet and towering presence of a performer as acclaimed and talented as Anita Ratnam. She has managed to cleverly weave an epic tale, classical and contemporary dance movements, the frailties of human beings, soul-stirring song and music, simple props and powerful storytelling into a 75-minute spellbinding performance of sheer, magical beauty. 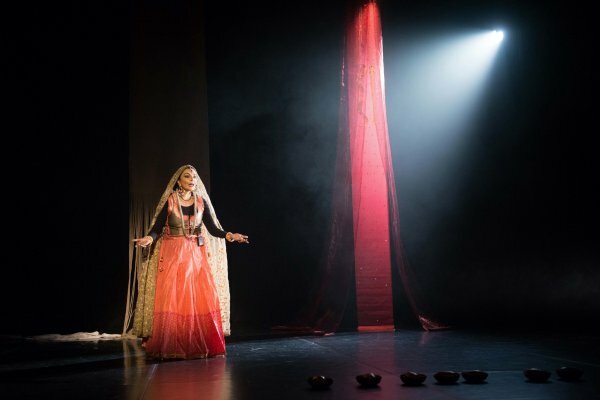 By re-telling the story of the Ramayana whereby the portrayal of a beautiful, happy, carefree Sita is transformed and reformed to show a woman who undergoes great suffering, Anita has used stage and story-telling to be a crusader for women's rights. With 'A Million Sitas,' Anita Ratnam has taken artistic licence and successfully tells of the hardships, pain and torture endured by the central female character in the Ramayana whilst also allowing the audience to appreciate the beauty of contemporary Indian dancing. Anita Ratnam has uprooted the centuries old story of the Ramayana and replanted it in the here and today - in a way that only she can do. Salutes from every woman in the world!